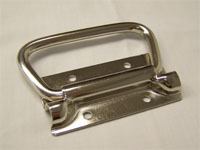 For the past 30 years, handles and cleats for various OEM applications have been one of our specialties. We have engineering, consulting and tooling expertise, and manufacturing capabilities to work with your unique specifications and individual needs. Our Basset Handle Catalog offers a wide variety of “in stock” Handles and Cleats, in many styles, which are available for your individual applications without tooling costs or minimums. A variety of finishes, including plastic coating, are available. 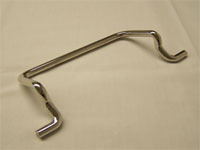 Formed tubular handles and cleats. Wire formed handles in various shapes. Large and small chest handles. 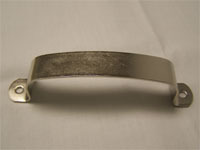 We can furnish a wide variety of Handles to meet most of your application needs. 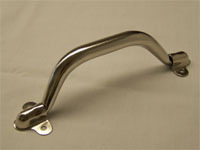 Shown below are some of the more popular handles from our product line. For a complete selection, please request a copy of our latest catalog by calling us Toll Free at 800-959-0374 or submitting our Contact Us Form. 4″ long x 1.875″ high, CRES material, in Plain, Black Zinc, Nickel or Plastic. 4 1/2″ long x 2 1/4″ high, CRES material, in Plain, Black Zinc, Nickel or Plastic. 3.2″ long x 1.38″ high, CRES material, in Plain, Black Zinc, Nickel or Plastic. 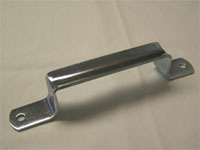 Seven additional types of Flat Handles are available. Please see catalog for details. 6 3/4″ long x 1 5/8″ high, .035 CRES material in Plain, Black Zinc, Nickel or Plastic. 6 1/4″ long x 1.5″ high, .032 CRES material in Plain, Black Zinc, Nickel or Plastic. 8.0″ long x 1.5″ high, CRES material, in Plain, Black Zinc, Nickel or Plastic. 5.5″ long x 2.5″ high, Wire, in Plain, Black Zinc, Nickel or Plastic. 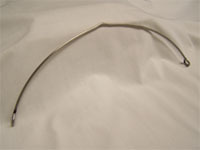 Three additional types of Wire Handles are available. Please see catalog for details.